For 2018, I decided to change it up and so I went and had my hair color dyed to a deep purple…Purple Haze is the color I chose. For what I wanted, nothing beats The Manic Panic colors. But I had to keep the color up and that was a whole process. Along comes my daughter who gives advice about keeping the color from fading. She told me to try oVertone conditioners and they had one for my purple hair!!! It is easy to apply and use daily no less. You can wash with warm to hot water on your hair. My prayers were answered. 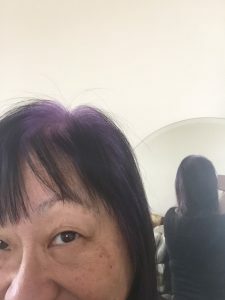 So everyone out there, if you are thinking of changing colors use Manic Panic (www.manicpanic.com) and I would go over to the oVertone website (https://overtone.co/) to get conditioners to keep your haircolor from fading and it smells great.